Of course, then she'd get criticized for wasting taxpayer dollars on clothes when she has perfectly good outfits she could wear, yadda yadda. And...that makes her no different from any other first lady...goes with the territory...You are in the spotlight. You will be scrutinized and criticized. There will always be someone commenting (both positively and negatively) about something. I think there is much wrong with what she was wearing other than the pants seemed too long. I wonder if this is just a thinly veiled attempt to spread the ridiculous word about her wearing a muslim hijab. The article says "she managed to be stylish and show respect to the muslim world......" Nothing wrong with that. "Oh, you've got to be kidding me," she said, before disagreeing with one Weekly Standard columnist's claim that she had given "a tacit endorsement of Islam's subjugation of women." "[T]hey saw this as giving me a gift from their culture," Bush said. "And it was the scarf with the pink ribbons and the pink edging on it, the breast cancer scarf, that I put on." She added later, "I think we all have these stereotypes of each other, Americans and Arabs, and it's a really good thing to be able to break those stereotypes down and get to know each other." People, it is STANDARD practice to wear a hijab when entering a mosque. Its the culture. Same as if you ever go to Turkey, most women wear them not because they are forced to, its because of the culture. True, but some people just like to crab about anything they can. Wow, looking at the link about her "look", I would hate to be the first lady, photos from every angle. I think she looks great in a dress with at least a little capped sleeve. She is very toned but she is mis-matched top and bottom and the tinyer her top the bigger the bottom looks. Funny how tall they and she are when they are next to other people, check the figure skaters photo, she is tall as most of the marines also. And again, I ask the question....Why did Laura Bush not receive the same harsh "criticisms" for her frumpy and lackluster style? Waiting for someone to give and "honest" answer to that question. Mrs Bush may not have been a trend setter but I am not aware of any occasion when she appeared in public dressed inappropriatly or looking ridiculous and Mrs Obama frequently does both. The photo below was taken during her first trip to europe, London actually. 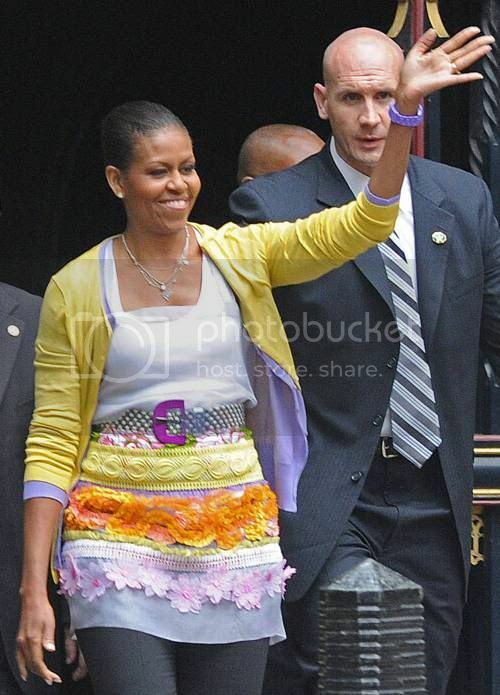 While Mrs. Bush was ever so elegant I find nothing wrong with the above outfit worn by Mrs. Obama. I would not call it elegant per se but it is down-to-earth, fashionable, fun, and not tacky at all though she could have used a different type of bra or cami if that is what I see squarely across the neck of her top. I guess showing cleavage might have been worse so I won't deduct any points from her. Yes I think that she is trying to set her own style. I am just a fan of the Jackie O look. Yes I think that she is trying to set her own style. That's one thing we can all agree on. Oh wait! Circus clowns did it first! I understand that the pants are too long because she took off her heels to enter the mosque but rarely have I seen such an ill-fitting outfit on someone in the public eye. I saw shots of Hillary Clinton yesterday in a hideous pants suit but that paled in comparison to Michelle's fashion disaster. I am so not a fan of the Obama's but I have seen Michelle in some pretty cute outfits so that Jakarta ensemble was off the charts in ugly. First ladies are supposed to look their best, especially when on the international stage but clearly she hasn't gotten that message. Somebody help her, please!!! The fabric looks like matte jersey to me. It's drapey but not ill fitting. I am not a huge fan of hers, but I do like her fashion sense most of the time! She is usually hands down the best dressed anywhere she goes, but I agree that this outfit was a very poor choice. There are many outfits she could have worn that are conservative, but do not look frumpy. And this outfit looked bad in the other picture as well.. it's just a very ill-fitting outfit that she should probably stay away from.